I have been writing about the Essenes and how they provided “The Teacher” with a core circle of trusted friends, as well as a vibrational hedge for his ministry. His twelve apostles and disciples were not all a part of that core. Only a few, such as his brother James, John the Beloved, his mother Mary, Mary Magdalene, and Joseph of Arimathea. Those who comprised his core and hedge lived in the Essene communities near the banks of the Dead Sea. Their purpose centered in living out of love, compassion and understanding. Their mission was about spreading The Teacher’s message of love among the people of the extended Jewish community. Few, however, had ears to hear and eyes to see. In this book, pictured here, we are given a portrayal of the Master Jesus and the essence of his message through a man named Daniel who lived in the Qumran Community at the time of the Teacher’s ministry. During a past life regression interview with Daniel through Stuart conducted by Joanna, here is what Daniel had to say about the Teacher’s personal atmosphere. Joanna had asked him about grace. Daniel: Grace is a gift of love and healing from the highest level. God going the extra mile to meet us upon the road of life. We considered that we were living in a time of Grace, and we felt that this Grace centered around Jesus. He was the bringer of our Grace because many cosmic energies focused around him, and made possible breakthroughs in consciousness, and a transformation in the lives of those who came into his presence. 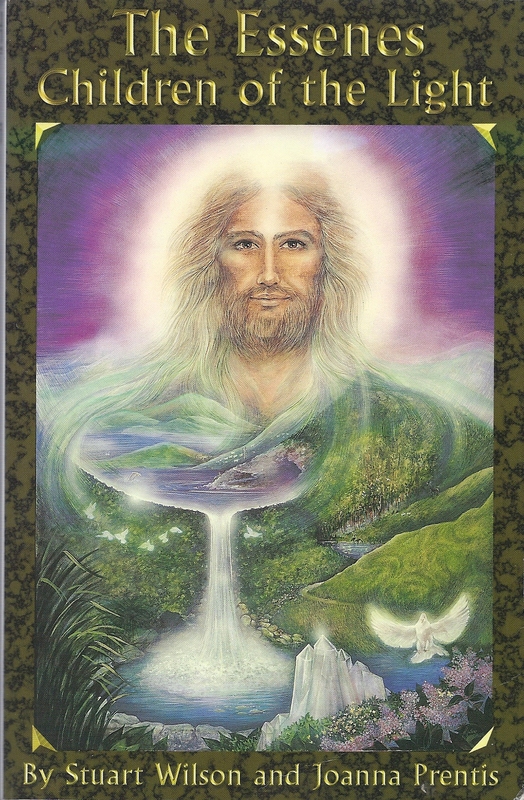 Some ones, who had sight upon very high levels, told me that when they looked at Jesus they did not see only his aura, they saw this vast vortex of cosmic energy whirling around him. They said it was like the layers of an onion, an infinite number of transparent layers of energy moving out and out into the universe. So that he was the center of all things, the center not only of our drama but the whole drama of the planet. He was the center of all things, and forces were gathered around him that made many things possible. Others who were attuned to the higher reaches of the angelic realm said that around Jesus they sensed the presence of very high angels. He was the bringer of Grace – who else could be a focus for all these energies? And because all these energies were focused together, we could move through our experience faster. It quickened everything. You could not be anywhere near him and not move more quickly along your path. Joanna: Tell me more about this vortex of energy surrounding Jesus. Daniel: We were aware that a whole vortex of cosmic energy revolved around Jesus and that anyone who encountered him stepped into that vortex. That was really the miracle for us. Not that he did this or that remarkable healing, but that his whole being was a focus of cosmic energy, and thus he could bring profound changes into the lives of all those he met who could accept these energies. As his work flowered he became more a timeless being, talking about timeless things which would be relevant in any age. Time did not touch him, he escaped from time and that was part of his work and part of his gift. But we knew that in the end time might dilute and distort the message he came to bring. Once the Teacher is no longer physically present, the Teaching may become changed and weakened. What needs to go forward is the essential message that Jesus was trying to convey: unconditional love working through the heart, and the surrendering of the will to the Divine Presence within. many did not want to hear this message, and would much rather have rigid structures. The inner truth is of the Spirit and lives, and anything which is of the letter has its day, flowers and is gone. Remember always that Jesus lived in a difficult and troubled time. Many people were frightened, and in their fear they clung to the comforting thought of a strong Father who would protect them. They preferred a strong external perception of Deity, a strong Father rather than the Divine Presence within. They saw the within as weak, and the external forces as strong and threatening. Jesus came to show them how strong the Divine Presence could be. How it could burn like a great Light within him and illumine the lives of all those around him, but many in their fear were not able to see this. He was offering them a chance to step out of the child state and become fully adult in the spiritual sense, but this step was too much for them. They wished to be the powerless children of a loving Father for a little while longer. You know, he never blamed them for that. He used to say that we should have faith in the ability of every human being to awaken at exactly the right time, like a flower which opens in its due season. If we choose to awaken and become spiritually adult we can become creators with God, but many were not ready for that. They wished to slumber a little longer, to be the passive children of creation, walking hand in hand with the Father but unwilling to share in Divine knowledge and Divine power. Joanna: And the vortex of energy around Jesus helped people to awaken at the right time? Daniel: Yes. Because of all the vortex of power around Jesus he was able to pull people out of an obsession with the past and into the moment. When they were in his presence, the past disappeared. They realized that nothing was important but the moment, and that they were free to act within that moment. This was one of the gifts Jesus brought for many ones, the ability to focus and act in the present in a way they had never experienced before he came. If you can forgive completely the past disappears for you. If you forgive completely you don ‘t need to worry about the future either, you can function as fully aware beings, fully conscious beings, working and moving in the moment and focusing the energies of the Divine Presence. Nothing else is important; nothing else will exist for you. That is why Jesus excited so many people. They could feel themselves being pulled out of time and into timelessness, out of the past into the everlasting present which is the only place in which you have power. The past and the future, if you are entangled with guilt or with worries and anxieties, rob you of your power. Only the present gives you power, and forgiveness is the key to ensuring you stay within that focus, expanding your awareness and living fully within the moment. This is living as God intended. This is joy. This is freedom – and this is what Jesus taught. This is the most wonderful gift which he gave to us. We feel that this section was one of Daniel’s greatest gifts, too. It made us see the work of Jesus in a totally new light, and we realized that it is as much needed today as when he taught this wisdom two thousand years ago. Somehow in these words of Daniel all the dead weight of centuries of dogma and doctrine fell away, and the message – and the gift – of Jesus shone through. Read my Health Light Newsletter online at LiftingTones.com. The current theme is the causes of depression.